Conveyor selection and design in the retail environment must address issues often quite different from those in the industrial setting. Even installing conveyors in the retail setting has its unique set of challenges. After 35 years in the conveyor business and thousands of installations both industrial and retail, PACLINE understands these differences and can offer you some of the best equipment and unique custom designs to meet your needs. 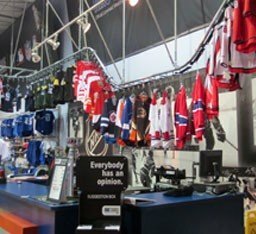 Uniquely curved track moves sports jerseys in large retail sports store. 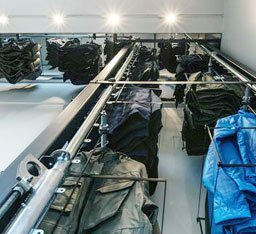 The ‘over-under’ capabilities of the PAC-LINE™ conveyor allows for this garment conveyor to move items in custom carriers straight up the wall. Track handles heavy property bags 50 lbs. per pendant (100 lbs. per rack). Standard curves offer very tight radius options allowing the conveyor to take virtually any path you want. Compact track and drive design means the equipment can be installed discretely in the ceiling or any area as needed. Sleek, tube-track has the moving chain enclosed to reduce noise compared to many other conveyor types. 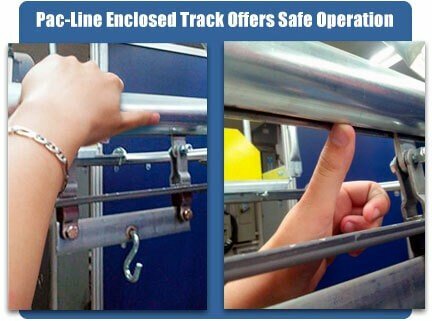 Safe for operators as the enclosed track prevents hands and fingers from contacting the moving chain. The PACLINE™ enclosed track design eliminates dangerous pinch points common in other conveyor designs. 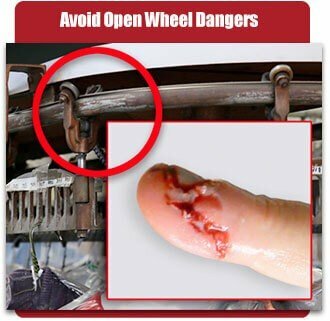 This is an extremely important consideration for garment conveyor systems where the hands and fingers of the operators can come in contact with the track and moving chain.